Welcome to the world of the powerful, of those who pull the right strings at the right time from the shadows of the big companies. Each player becomes one of these people, trying to increase their power and influence by hiring Employees, creating New Departments and taking over the sought-after positions of Divisional Heads to procure influence and privileges. Divisional Heads can resign to join the Board of Directors (in the hopes of becoming the Chairman, of course) or get hired as an External Consultant. All the while, players are investing in stocks and bribing other players to make their way to the top. 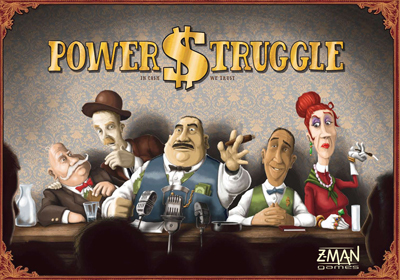 I love business themed games, and Power Struggle is one of the best I've tried. One of the best things about it is that you have so many possibilites and so much freedom in choosing what you want to do.